After continuing our journey with John Crichton last week with “The Way We Weren’t” and “Picture If You Will,” our Farscape re-watch continues this week with the seventh and eighth episodes of Season 2. Whereas “Crackers Don’t Matter” took a humorous–albeit very darkly humorous–approach to dealing with the limited food supply aboard Moya, in “Home on the Remains,” things are much more dire, and that is because in “Crackers,” there was still food to be had, and squabbled over, but at the start of “Home,” they have already completely run out, and are all effectively dying of starvation. Although hunger is a rare reality in space shows, there are a few other–albeit rare–instances I can think of in which rationing was required due to food conservation issues, such as in Star Trek: Voyager and the new Battlestar Galactica, but I don’t know if any other show has ever gone so far as to push the crew to the point where they are entirely without any sustenance whatsoever. And Farscape ups the stakes even further through Zhaan. While everyone is extremely hungry and possibly haven’t eaten for days by the start of the episode, most of them would take a while longer to succumb. Due to Zhaan’s physiology, however, she needs food now or she will die. She’s begun to bud, spores growing out of her body, and if she doesn’t get meat as soon as possible, she is doomed. Furthermore, her current state puts Moya in danger, as well, as the micropollen she is producing at an alarming rate is messing with Moya’s sensors, even with all of the atmospheric scrubbers at full capacity, and if the situation remains this way for too long, she could be permanently blinded. Aeryn remains on board while everyone else goes to seek food, because she is less susceptible to the allergens, and yet as the episode proceeds, even she becomes bleary-eyed and stuffy, barely being able to breathe, which increases the tension all the more. And to make matters even worse than they already are, as Zhaan’s situation continues to deteriorate, she starts to regress to a primal, feral state solely driven by her survival instinct, losing all semblance of her usual self. We have seen Zhaan go dark before but nothing to this extent, where her very personality is subsumed by her primitive needs. Virginia Hey makes her particularly eerie when she delivers the line, “Animal proteins stop the budding cycle…Buds evolved for protection. Vermin immobilize us. Predator attacks. Buds poison animal. When animal dies, we eat animal. To recover,” because she no longer sounds like a person at this point but the highly evolved plant that she is. This overwhelming desire to survive also leads to her becoming extremely paranoid, again thinking of Aeryn as nothing but a Peacekeeper who is trying to harm her, despite Aeryn’s best efforts to make her better–an interesting flip on the norm, as it’s usually Zhaan tending to a sick Aeryn. Unfortunately, each attempt only makes things worse. In almost all past situations where we’ve seen Aeryn use her mind to come up with a scientific solution to a problem, she has succeeded. This time, however, for example, when she logically assumes that since Zhaan is a plant that light will help her, instead all it does is increase the growth of the buds, which leads the addled Zhaan to jump to the conclusion that Aeryn is trying to finish her off. Significantly, however, the verbal bile she begins to to spew at Aeryn isn’t the only time recently that she has reverted to her old beliefs about Aeryn and her Peacekeeper past. In “Crackers Don’t Matter,” arguably the only negative thing she did while maddened by T’raltixx’s light was to accuse Aeryn of considering selling them out to Scorpius, and in “The Way We Weren’t,” she turned on her for her past behavior, and while she didn’t remember what she did in the first case and later seemed ashamed in the second, she never fully apologized in either case, implying that on some level, she has had a hard time shaking her initial prejudices against Aeryn internally, even though she does–as she revealed in “Mind the Baby”–love her at the same time. But the writers aren’t simply becoming a broken record in this regard, as this third time does prove the charm. At the end of the episode, when Zhaan finally gets her required food and is on the mend, she takes the time to apologize to Aeryn. Although she didn’t have control over her actions at the time, she still acknowledges how much she put her through, and when Aeryn tells her that she wasn’t herself, she responds, “No, I was the mindless savage I accused you of being. It wasn’t very pleasant reverting back to such a primitive, vicious state. I’m sorry for what I said.” The fact that she doesn’t just focus on her own journey here but is actually able to empathize with Aeryn makes for a lovely moment between these two women who have had trouble bonding in the past and, although it’s a quiet scene, and Aeryn outwardly shrugs it off as being unnecessary, it clearly means a lot to her. It reminds me of when John showed her that he could understand what she was going through on the Zelbinion in “PK Tech Girl”. I believe this is also the last time that Zhaan will ever use Aeryn’s past against her. But this is all technically only the B-plot. The main thrust of the story involves the others’ attempts to get food for Zhaan and themselves. Although there are no planets in the area that might be able to give them what they need, Chiana is actually aware of a mining colony in the area that exists within the corpse of a Budong, a giant space beastie whose dimensions are honestly almost too huge to comprehend. It seems to be at least the size of a large city. 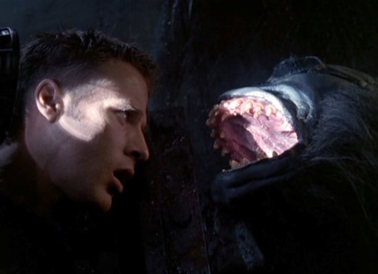 Firstly, I have to say that I love that the world of Farscape has what is effectively a huge, space-dwelling “sea monster,” any sort of real-world physics be damned. As I’ve said before, Farscape is just as much a dreamscape as it is a space opera. And, as fans know, we will actually get the chance to see a live Budong in the third season’s Ben Browder-penned episode, “Green-Eyed Monster”.